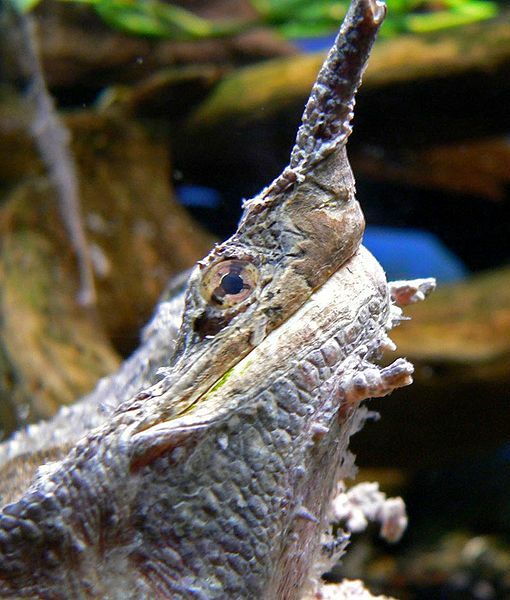 The mata mata is a large sedentary turtle that has a large triangular flattened head characterized with many tubercles and flaps of skin and a "horn" on its long and tubular snout. There are three barbels on the chin and four additional filamentous barbels at the upper jaw, which is neither hooked nor notched. The mata mata's brown or black oblong carapace can measure up to 45 cm (18 in) at adult age. The full adult weight is 15 kg (33 lb). The mata mata's plastron is reduced, narrowed, hingeless, shortened towards the front, and deeply notched at the rear with narrow bridges. These may be meant to allow the turtle to resemble a piece of bark, camouflaging it from possible predators. The plastron and bridges are cream to yellow or brown. The head, neck, tail, and limbs are grayish brown on adults. The neck is longer than the vertebra under its carapace and is fringed with small skin flaps along both sides. Hatchlings show a pink to reddish tinge in the underside edge of their carapace and plastron that gradually disappear as they grow. Each forefoot has five webbed claws. Males have concave plastrons and longer, thicker tails than females. Schneider, J.G. 1783. 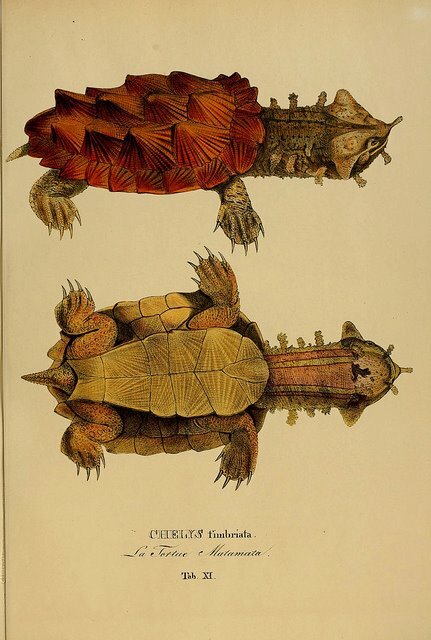 Allgemeine Naturgeschichte der Schildkröten, nebst einem Systematischen Verseichnisse der einzelnen Arten. Müller, Leipzig. xlviii + 364 p.